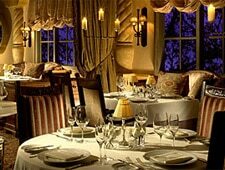 Elegant modern American cuisine in an old-world setting at the Rancho Bernardo Inn. : El Bizcocho, the old-world fine dining haven at Rancho Bernardo Inn, has cultivated some serious chefs like Gavin Kaysen and Steven Rojas, and now newcomer Ryan Grant has arrived on the scene with a burst of energy and creativity. He carries an impressive culinary card with training under Jean-Georges Vongerichten and Alain Ducasse and hails from a recent stint at Elizabeth in Manhattan. We are excited to see him shake things up a little in the slightly staid El Bizcocho, and he has jumped right into the mix with over-the-top concoctions like his signature drink, the Absinthe Minded Professor cocktail, made tableside. El Bizcocho still exudes elegance and old school charm with its lavish low lit ambience, extravagant tasting menus and serious wine list. Appetizers include Colorado lamb tartare with strawberries, wild ramp risotto with spring peas, and hamachi with pomegranate ponzu. Tempting entrées line the menu like dayboat scallops with chorizo and sweet corn or Muscovy duck with rhubarb and tandoori honey. Sommelier Barry Wiss presides over the wine holdings, which encompass 1,600 selections for delightful pairings.